The Derbyshire White Peak is dotted with these circular features. Some are stone but most seem to be made of concrete. This was one of the few that had water in. 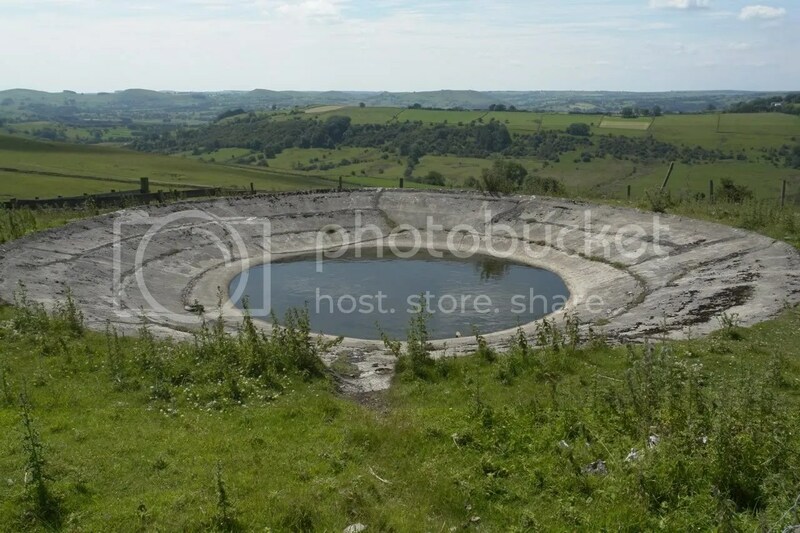 This entry was posted in Travel and tagged Derbyshire, Dew ponds, Flying saucer, limestone topography. Bookmark the permalink. Dew ponds, we call them round these parts. I don’t know that there’s ever enough dew to fill one but the rain seems to do the job. We’re on chalk soil so all of ours are made of concrete, as chalk is so porous. I believe that at one time they were made of paddled (puddled) clay, and their purpose was to provide drinking water for sheep and cattle.